Chromebooks, by their very nature, are mobile machines built for individuals on the go. With their quick boot times, nimble nature, and always-connected personas, Chromebooks are found often in the hands of individuals who value those traits. People who value the light and quick nature of Chromebooks tend to find themselves on the go a lot, in places like coffee shops and airports, trying to get a few things done on the move. For people like that – people like myself – the Lenovo Yoga Chromebook C630 may be just the right combo of speed, power, build and screen size. Let’s take a deeper look at what makes this device a portable workstation powerhouse. When it comes to looks and feel, Lenovo put together a great package with this latest offering. A deep-blue, soft-touch, all-aluminum shell both looks and feels the premium part. The first time you pick it up, you get the sense that this Chromebook is simply put together better than most. The hinge holds everything together in a sturdy fashion and regardless of which way you use the Yoga C630 (it is, after all a convertible that can be used in clamshell, tent, presentation, and tablet modes), there’s a simple reassuring quality to the frame. I like holding it and the build simply makes using it a pleasure. While there are no creaks or flex in the chassis, you will notice the fan ports and general fingerprint-prone nature quite quickly. I keep a microfiber cloth handy, so the smudges don’t bother me too much. The fan ports, while clear and obvious, don’t dominate the landscape and never made me curl up my nose at the look of them. Sure, this is a big Chromebook that houses a big, 15.6-inch display, but the 17mm, 4-pound chassis makes handling this big device a bit less unwieldy. In a backpack or in my hands, I never had the sensation that I was carrying around a beast. The size and weight may be at the top of what I want to carry around, but they were never off-putting in use. As you open up the device, you are met with that 15.6-inch display and it’s relatively-small bezels. Upcoming devices like the ASUS Chromebook Flip C434 will make these bezels feel large once it is out, but I’m pleased not to have an already-large device made larger just to accommodate big bezels around the screen. 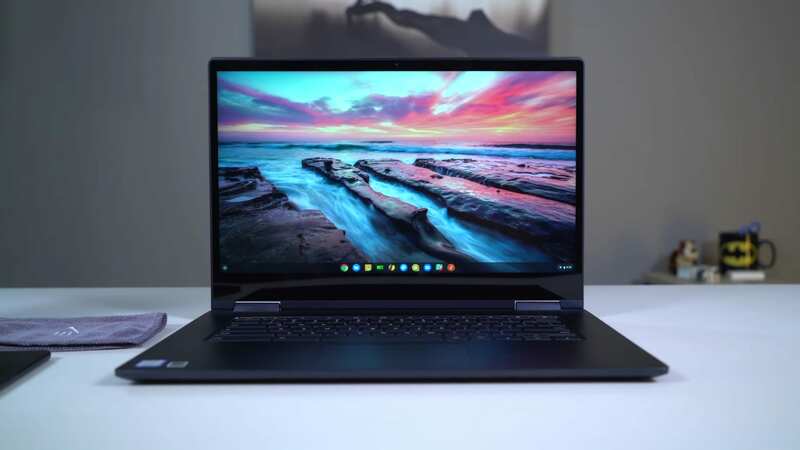 For the sake of mentioning it, Lenovo announced this devices as the first Chromebook with a 4K display, but it doesn’t look like that model is shipping any time soon and may not even come to the US. For now, the 1080p model is the one you’ll get if you order this, and I’ve been very happy with it. The FHD 1920×1080 panel that hits about 300 nits of brightness, has very wide viewing angles, and delivers warm, rich colors. While it does bend towards warm on the temperature scale (more yellows than blues), when viewed on its own this was never an issue. More important is the size of the display. At 15.6-inches, this panel gives on-the-go users a great workspace without the need for external monitors. Multiple times since adopting this Chromebook as my daily driver, I’ve just unplugged and worked in random places away from my desk simply because I could. Don’t get me wrong: I love my Pixelbook and can get plenty done on it away from my desk and second screen. It’s just that, with the Yoga C630, I felt even more comfy doing so. There’s something stress-relieving about extra screen real estate and for my daily routines, the more I have of it, the better. If this device was a bit larger or heavier, I don’t know that the benefits would outweigh the downsides of toting around a 15.6-inch device. However, Lenovo seems to have struck just the right balance between size, thickness and weight for me. Simply put, the screen size paired with the reasonable size and weight of this device just kept bringing me back to it even after my review period was over. I don’t need to say much about the keyboard/trackpad combo on this device apart from saying it is great. Lenovo makes great keyboards, and this is not exception. Great click, travel and feel make typing on this device a fantastic experience. I hate that backlighting seems to have been left out, though. Lenovo still lists these devices as having backlit keys, so I don’t know what the issue is. Even communicating directly with them, we’ve received little guidance on what the issue is, here. Regardless of why the keys don’t have backlighting, it is a shame that it isn’t present given the overall quality of this Chromebook. For the trackpad, it isn’t listed as glass, but I’m inclined to think it is. If not, the material it is made from is insanely good and I’ve had zero issue with inputs. Gestures are precise and oil buildup is very managable. Oh, and the click is perfect. I’ve been typing every article and line of code for the past couple weeks on this keyboard while using this trackpad and I’ve not pined for my Pixelbook once. They are a great combo. The selection is pretty standard for late 2018, delivering what has become my favorite setup on Chromebooks: 2 USB-C ports (one on each side), a single USB-A port (for those legacy peripherals), a microSD card slot and a Kensington lock. A headphone/microphone jack is also along for the ride and makes for a port selection that covers most bases for most users. Speakers are probably my least favorite part of this Chromebook, coming in at a solid mediocre. Sure, laptop speakers are usually a snooze-fest, but with devices like the Pixel Slate, Dell Inspiron Chromebook 14, and Acer Chromebook 15 all sporting better speakers, I was hoping for a bit better from Lenovo. Sadly, these speakers just don’t impress. They get the job done and will suffice for Duo calls and a quick video here or there, but don’t expect too much from this set. Sure, Lenovo knocked it out of the park on screen, build, and input methods, but what about performance? I’m pleased to say this is one of the fastest Chromebooks I’ve ever used. From pushing two displays to opening multiple tabs, apps, and windows, this thing never even started to sweat. In the review video, you can see me performing the same tablet multi-tasking gestures that bring the Pixel Slate to its knees on the Yoga with no slowdown and seemingly infinite headroom for more. We could talk benchmarks and such, but it isn’t necessary. This thing is a beast and will do everything and anything you ask of it. Our unit came equipped with an 8th-gen Core i5 (U-series, hence the fans), 8GB of RAM, and 128GB of internal storage. Pair that with the reduced load of only a 1080p screen and you have a recipe for insane speed. I simply cannot overstate how well this Chromebook performs. Again, with the manageable weight and large screen, this device makes for a perfect road warrior. Battery life has been excellent as well, clocking in around 8-10 hours of mixed use with the screen up near 80%-100%. As is becoming common with Chromebooks, battery longevity simply isn’t something you need to really worry about. When all the pieces come together like this, devices become really simple to recommend. Sure, it has a few hiccups, but all devices do. If this Chromebook came with backlit keys and a stowable stylus, I think we’d be flirting with near perfection. As it stands, this one has become one of my top recommendations and likely will stay that way as 2019 wears on. If you are on the go a lot and need a portable workstation with plenty of room and power to spare, I don’t think you can go wrong with the Lenovo Yoga Chromebook C630.